Just found this on 1st Dibs, as I’m sure most of you have. But, just in case….enjoy reading this interview with the girl from down-under. After spending much of the weekend browsing my new magazine editions – House Beautiful, House & Garden and Elle Decor, I was obviously not sated as I spent a few more hours flicking through some old Vogue Living’s – which is where I found this. I know there a few others like me in the Blogosphere who are looking forward to the actual launch of Emma Jane Pilkington’s website. I think it’s as much her talent as the fact she’s originally from Melbourne (like moi) that I find it interesting to watch her career. 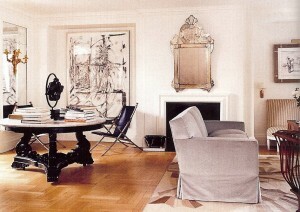 Either way, I think the home she has designed for herself and her husband in her adopted home, New York, is très chic. Pilkington sits on a sofa by Anthony Lawrence-Belfair, covered in an Ulf Moritz fabric, “Nimbus” from Sahco Hesslein. The marquetry flooring is actually a painted effect. I adore this room. It has such a quiet elegance about it, and shows that Pilkington has a very discerning eye. A regency chair and a Louis XVI mahogany and leather desk sit atop a 1940’s fan-shaped rug made from vintage kilim pieces. 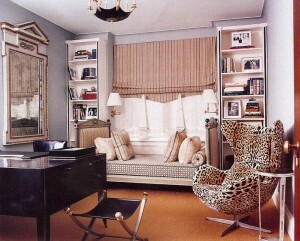 A 1920’s desk and a directoire period daybed mixed with an Arne Jacobsen “Egg” chair covered in silk leopard in the media room/office. A very unexpected combination, but I like it. The Master bedroom’s 19th Century English light was the inspiration for the rest of the decor. The 19th Century bed was enlarged to King-size in France. Ebony and marble table with leather campaign chairs and 19th Century gilded sconces in the living room. I like the use of subtle contrasts in colour and style – it makes for a very captivating interior. Images from Vogue Living (Australia) November/December 2006.